If you are looking for information on the Erbert & Gerbert's Subs & Clubs franchise business opportunity, Erbert & Gerbert's Subs & Clubs franchises or Erbert & Gerbert's Subs & Clubs franchising, then you have come to the right place. 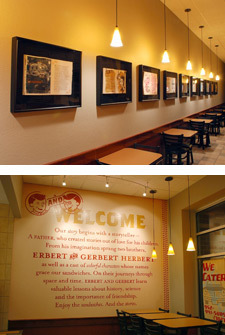 Erbert & Gerbert's Subs & Clubs is a quick service sandwich shop serving up the best sub sandwiches on the planet. In a complicated and fast-paced world, our operation is simple, proven, efficient and easily trainable. We are a franchise you can be proud to operate. Our delicious sandwiches are unequaled in quality, freshness and consistency. Our unique and engaging brand is growing strong and seeking ambitious, talented and committed individuals experienced in business or restaurant management who are ready to develop their future with a proven and established system. Our story begins with a story-teller: a father who created stories out of love for his children inspired his son with the adventures of Erbert and Gerbert Herbert as well as a cast of colorful characters whose names grace our sandwiches. On their travels through space and time, Erbert and Gerbert learn valuable lessons about friendship, history and science. This is the framework that is undeniably unique to our Brand and allows for a marketing strategy that appeals to customers of all ages. Along with our scrumptious sandwiches, our deep-rooted history engages our customers to keep coming back for more. Whether you're seeking to develop a location in the Midwest or elsewhere, we have a strong and dedicated following that spans the globe. Tremendous potential exists with our efficient delivery service and professional catering program. Delivery of one or 1001 sandwiches offers our customers an added benefit to their hectic lives. Our catering options, including box lunches, sandwich platters, party subs and group soup, offer customers a variety to choose from to serve groups large and small. Developing, training and operating the Erbert & Gerbert's model is consistently simple allowing for low start up costs, efficient staff training and consumer consistency. Our menu is uncomplicated, offering 14 sandwiches on our fresh-baked bread as well as several varieties of hot soup.